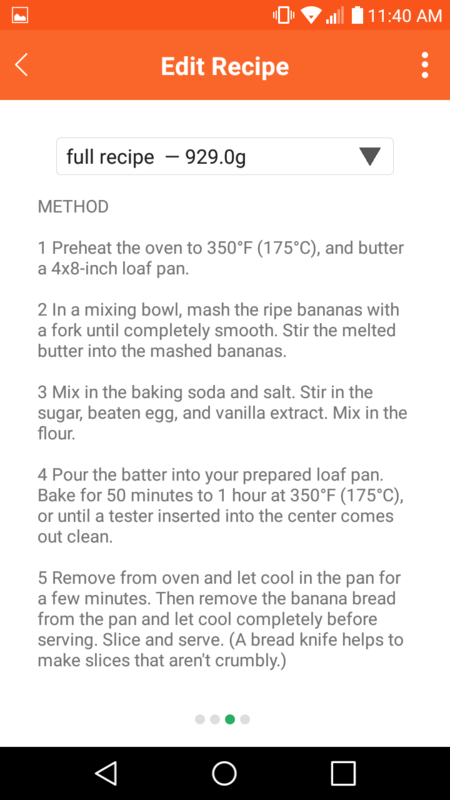 I thought it would be a good idea to add a spot to enter cooking instructions for new recipes that we create in this app. (Somewhere other than the tiny notes box I mean). When you select an already made recipe you have the option to view or edit. If you select view it gives you a summary of the nutrient values (maybe an image of the nutrient label), as well as displaying a list of ingredient measures, then the step by step cooking instructions. All of which you would enter when making a new recipe, or when selecting the edit option. In other words, just keep what you have as the edit function as far as nutrition info, but add a spot for cooking instructions. Then have it display a more clear and condensed version of that info in a view tab. I'm a big fan of cronometer. I appreciate how its primary focus is as a way to accurately plan and track your diet rather than as a social media outlet like myfitnesspal, (which is so cluttered I couldn't be bothered to press the log in button anymore). The more mental obstacles you remove between someone and their goal the more likely they are to reach it, and cronometer does just that. Its no b.s. approach is perfect, from the moment you log in your food diary is there ready for you to enter your meals, see were you are at with your nutrients and calories, and move on. Then everything else is there for when you have free time to customize, plan, or hop over to the nicely separated community aspect. All that being said. It would be nice if there was a little more customizability that allowed cronometer to be your one stop shop. For example, I would like to not have to enter all of my recipe information into cronometer, then create a completely separate spreadsheet or document somewhere else to have clear and concise directions for when I cook it. Thanks for your support and feedback! We are in the process of redesigning our recipe editor - we have a newer version out on the Android app and are currently rolling it out for the iPhone app as well. With this new design, you can enter the cooking instructions in the Notes page and then view the instructions in the Nutrient page as well.